Originally this article was written before Bush decided to go to war--and, unfortunately, I believe it reflected exactly what was about to happen and the lies that were told. Nothing has changed except that our government is becoming the most dangerous government on earth--for every nation and America as well. Demand a stop to the illegalities that are being committed in the name of "democracy". It seems as if war with Iraq, or rather a "preemptive strike" by America against Iraq, is looming on the horizon as inevitable. While all but Britain and Italy are staunchly against such an act by the United States, the Bush administration continues to manipulate the public and to create "facts" to back up its claims that Iraq is amassing a huge arsenal of nuclear and biological weapons to use against the United States. Public debate about the honesty of the President and the need for such action has been muted with, what Senator Sam Farr notes, "a real fear. No one wants to be seen as unpatriotic after 9/11." Bush has come out to say if his war efforts are not universally supported at home and abroad then we are supporters of evil, unpatriotic and terrorist by our own inaction. This is pure manipulation. Recently one retired senator stated that the American public has been duped into "false patriotism". The 9/11 attacks were terrible and those responsible must be brought to justice. But to manufacture "evidence", to divert the public's attention away from domestic issues with false information, to actually re-write history, is criminal and totalitarian. Let us review the charges against Iraq. 1) Iraq is manufacturing weapons of mass destruction. Analysis: While Iraq may want nuclear weapons it doesn't have any. Latest US intelligence estimates indicate that it would take at least 5 years for Iraq to manufacture its first nuclear weapon if it is able to obtain the necessary materials. It is interesting to note that Israel has 200 nuclear weapons, and India and Pakistan also are nuclear powers. Pakistan's history of instability has never been cause for alarm by the US government. Israel's recent history of destroying the Palestinian people, including illegal land grabs, torture, murder and human rights violations gets little more than a blink from the Bush administration. Iraq has possibly 20 al-Hussein missiles with a maximum rage of 400 miles. That means the nations immediately surrounding Iraq, Egypt, Israel, Syria, Turkey, Iran, Saudi Arabia, Qatar, Kuwait, Armenia, Russia, Georgia and Azerbaijan may be threatened but certainly not the US. 2) Iraq is manufacturing biological weapons. Analysis: Probably true. Iraq used bio-agents to kill hundreds of Iraqi Kurds. By the way the US knew this was in the works and didn't intervene at the time. Iraq also used poison gas against Iranian troops in the Iran-Iraq war. Other nations with such bio-agents are the United States, Russia, China as well as other "friendly" nations. It is likely that any ground force that the US would send into Iraq would be met with such biological weapons. 3) Iraq has refused weapons inspectors. Analysis: True. Even when Iraq allowed UN inspectors in to review Iraq weapons capability it is unlikely that they were allowed to see what they were looking for. However, would the US or Britain or Russia or China allow inspectors from other nations in to review their weapons manufacturing and capabilities? No, of course not. The US demands compliance from other nations that it would never allow of itself. Israel has rebuffed UN resolutions as well but we have not seen fit to attack them. 4) Saddan Hussein is an evil and cruel man. Analysis: True. He is responsible for the murder of thousands of people. He rules with an iron hand. However the US has had a very long history of supporting cruel dictators in the past. The US either ignored or supported atrocities committed by such men as Idi Amin who killed, and ate, his enemies, or the warlords in other destitute African nations. In fact the US has supported Hussein over the years and was responsible for the installation of the Taliban's in Afghanistan. The US didn't raise a finger while the Taliban exacted a terrible price from the Afghan people. Atrocities, murders, and human rights abuses were rampant and approved by the US up and until it was found that the Taliban supported the 9/11 terrorists. It was only at that time that the history of the Taliban and their acts became a source of concern for the government. The US has had a selective memory in regards to genocide perpetrated by other governments and will support them as long as they were anti-Communist in nature. Now those omissions are coming back to us. Presently we support whole-heartedly the acts of a madman leading Israel. Israel is treating the people of Palestine in the same manner in which the Nazis treated them. Torture, murder, civil and humanitarian rights violations are common acts of the Israeli military toward the Palestinian people who are denied free movement, food, medical attention, jobs, education and their right to live. The terrible suicide bombings are just that, terrible. They cannot be condoned but they can be understood. It is interesting though that in the six week period when no suicide bombings took place in Israel over 70 Palestinians, many of them children, were killed by the Israelis—with not so much as a footnote in American newspapers. 5) Iraq is linked to al-Queda. Analysis: This is a recent claim to add fuel to Bush's meager flame to support an attack. There is no evidence, according to intelligence sources, that Iraq is linked in any way to al-Queda in a supportive manner. Some Taliban and al-Queda operatives may have been present in the northern part of Iraq where the Kurds reside but received no support and were not hidden by Iraq. Al-Queda are also present in Pakistan and Iran and the majority of the 9/11 terrorists and many of the al-Queda now in detained in Cuba came from Saudi Arabia but the US is not contemplating attacking those nations. 6) Iraq is responsible for the West Nile Virus. Analysis: Give me a break. Are we entitled to attack Iraq with a "preemptive strike"? No. The Iraqi government is corrupt and iron fisted but so are many other nations that the US is friendly with. The Iraqi government would like to have more potent weapons but it is extremely unlikely that they could even deliver them with a 24 hour fly over by US and English aircraft which regularly bomb installations when it is detected that ground radar has been activated. The aerial surveillance being maintained by the US over Iraq can detect individual people on the ground and would surely detect any movement of weapons and personnel. The US has never attacked another nation first and to do so, and to advocate the death of another leader, openes up, as an Egyptian diplomat said, “the gates of hell”. This will establish a very dangerous precedent that will likely come back to haunt us. Bush's motivation for his plan is not one to protect our freedoms, but to protect US big business and financial interests in the oil rich region. He was not allowed to drill for oil in the American wilderness so he will take it in Iraq. 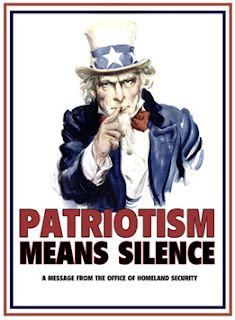 Our freedoms, which he so bravely wishes to defend, have been dangerously eroded with the "Patriot Act". Our library records can be examined at will, our book purchases can be reviewed at our local bookstore, wiretaps are rampant, Bush wants you and your neighbors to spy on one another, anyone can be detained without cause for an indefinite time without identities being disclosed, without attorney access and without your families being notified. Is this the America you know and want? Cloaking such evilness with flowery words and false patriotism is wrong. The US is the largest arms supplier in the world. We produce more land mines than anyone. We now label any freedom fighter in the world as a terrorist. We demand that every other nation support us in our fight but refuse to support them in theirs. "US Study discovers growing poverty"
"Good morning! Now get ready for war, poverty"
"Every stream in US may be contaminated"
By the way the article on the contamination of the nations streams also stated that 1/5th of animal species and 1/6th of plant species are at risk of extinction in the US.